Cherry Picker is Ireland’s largest provider of sales and service for all makes and models of powered access machinery. Cherry Picker have been supplying access solutions in Ireland for over 20 years. By listening to our customers we provide the right access solutions to our customers access problems. Cherry Picker supplies all the leading makes of access machinery in Ireland and are the main dealer for Oil & Steel and Genie Machines. Our Company is a dynamic, wholly Irish owned sales company supplying access solutions to the Irish & European markets. Due to our experience, we have perfected the specialised skills to provide Sales and Hire of Truck-Mounted Booms and Van Mounted Platforms, to name just a few and we also offer Service/Spare Parts and MEWP Training for the Access industry. 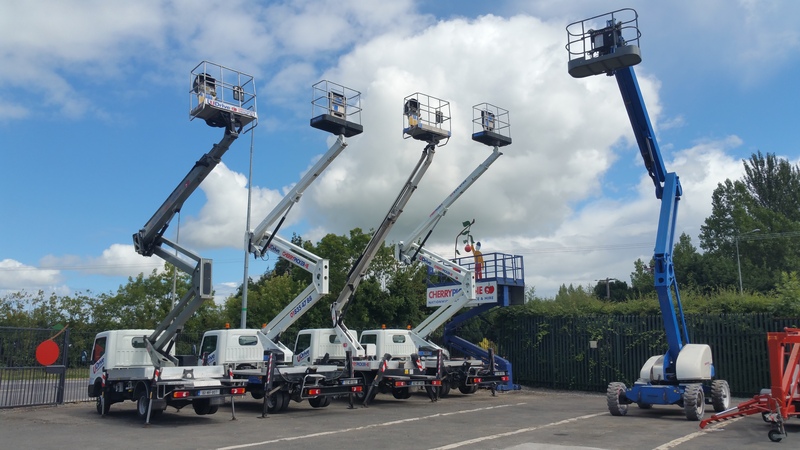 Cherry Picker is the only Powered Access Company in Ireland that focuses on the Sale of Access Machinery. Finding the right machine for every customer is our main objective. Our sales team has extensive knowledge of all makes and models of access machinery which enables us to meet your requirements and expectations. Over the last 20 years, we have been in operation we have formed alliances with all leading manufacturers of access machinery. In this time Cherry Picker has been awarded official distributorships for leading brands which gives us the largest range of machines from which to solve all access problems. We offer an extensive range of scissor lifts, articulated and telescopic boom/hoist lifts, track mounted booms/hoists, truck, van and cab mounted booms/hoists, aerial work platforms and material lifts. A full range of both New and Used Machines are also available. Cherry Picker also offers service, spare parts, break-down and emergency call outs and complete refurbishment service. The dedicated engineering team consists of some of the most experienced engineers in the industry. Here at Cherry Picker we try harder! All of our customers are important to us, from large multi-national organisations to small companies and individuals, we work closely with everybody. We pride ourselves on having a personable and dedicated team for our customers. So, it is easy to stay in touch with our friendly staff. Contact our experts at 01 835 4788 to discuss any Cherry Picker related query you may have. Lenny O'Donnell, Ian Lawlor, Tony O'Rourke.